What a CRAZY day. So many things to show and tell. I love Wednesdays. It's such a perfect break in the middle of the week to not have to work and to spend my day exploring. The first thing I think to do is to go fishing in the morning. I was a little concerned about the weather because of the wind and cold. It wasn't terrible, but I was considering making the long run out to Raritan Bay again and I didn't want to be too uncomfortable. As I got in the water and began cruising up the Shrewsbury River I made the decision to not go all the way out. I still have some striped bass in the refrigerator and it just wasn't worth it to me to be miserable and cold. Unknown to me at the time, there was a tremendous amount of action going on up the Navesink River. I rarely explore this area but this would have been the perfect time to do so. Apparently there was a massive school of bunker up the river that was being attacked for hours by big bluefish and bass. Opportunity missed. I stayed close to home and decided to check out the fluke holes where I have had success in the past. I put two rods out and on the first drift I hooked into a nice fluke. A few minutes later I caught another nice one on the second drift. Fluke season officially opens next week so these two fish went back into the water. It's just nice to know that they have arrived and I will be anxiously anticipating opening day. It's too bad I didn't venture up into the Navesink though. A few bluefish for the smoker would have been nice. In the early afternoon I decided it was time to test out my primitive survival skills and make a fire. On the internet I came across some information on making a fire using a hand drill. In the past I've used a bow drill. Although they say the hand drill is more difficult, I wanted to give it a try and add some modern modifications to the design. Before picking up the kids from school I went out into the woods to gather some supplies. I found a few dead cedar tree branches. Nothing large like I was looking for - but cedar is a good fire starting wood so hopefully the branches I found will work. 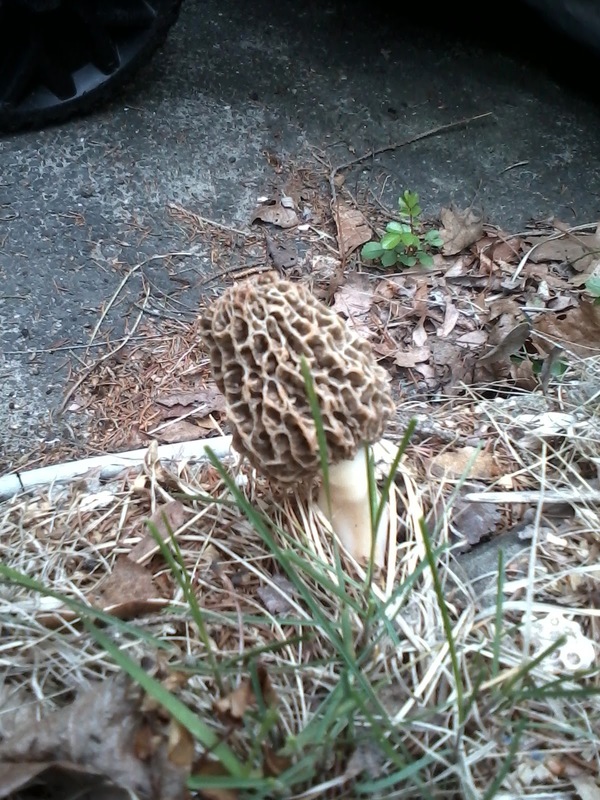 Apparently a couple of morel mushrooms had popped up right in her backyard! Morels! For anyone who knows anything about wild mushrooms, this is the king. This is Survivor Diet gold! Kathy was thoughtful enough to recognize this for what it was and offer it to me as a gift. I didn't hesitate. I drove right over and picked up 2 morels from her yard. I did a little perimeter search for signs of any more but those were the only ones. This is a Survivor Diet first for me. It inspired me to plan a mushroom foray in the very near future. If morels are around, I want to find them. So I get back home and decide to try to take a really nice photo of this crazy looking mushroom. I go into my back yard and start snapping some pics like this one. I wanted to honor this new find, giving it the attention it deserves. First Morel! What a beauty. Well, after a few minutes I heard a bit of a commotion over by the small animal trap that I had set up. I couldn't believe it but I had trapped a mocking bird! It was trying to escape and making a ruckus. What luck. By trapping this bird I have successfully demonstrated a primitive survival skill and I have unlocked my first Survivor Diet Challenge weekly reward. It's about time. Butter and spices! And not a moment too soon with this newly acquired morel in my possession. I humorously 'mocked' this bird for a minute before releasing it. It needed a little bit of its own medicine after bing stupid enough to get caught in my feeble excuse for a trap. Not only have I unlocked my first reward but by releasing this small animal I have also earned the right to purchase a small animal to eat from the market (very small). Today was a win-win-win day for the Survivor Diet. It feels really good to have a string of successes like that - especially in the face of hardship and despiration. It makes the success that much sweeter.